Have a question about Parkside? You can list your preferences on your resident profile and housing application and we will do our best to place you in the unit that fits those requests. All requests are served on a first-come, first-served basis and are taken in order based on the date your application was received. Yes, you can apply using our online application. Yes, you can list the roommates you have chosen on your roomate profile when completing your lease. It is important that all roommates list each other and that all requests are mutual. You can also outline roommates on your application. Yes, you will complete a roommate profile when completing your lease contract that will inquire as to your study habits, social habits, and hobbies to help us match you with residents that have similar preferences in your floor plan. Residents may make payment for their rent via PAP, post-dated check, or online via debit or credit card via a service called Rent Moola. An individual lease provides each resident with their own separate lease agreement and responsibility for his/her rental installments and applicable utility and parking charges. By signing an individual lease, you are only taking responsibility for your rental installments and lease terms and will not be held liable for any delinquent amounts owned by your roommate(s). 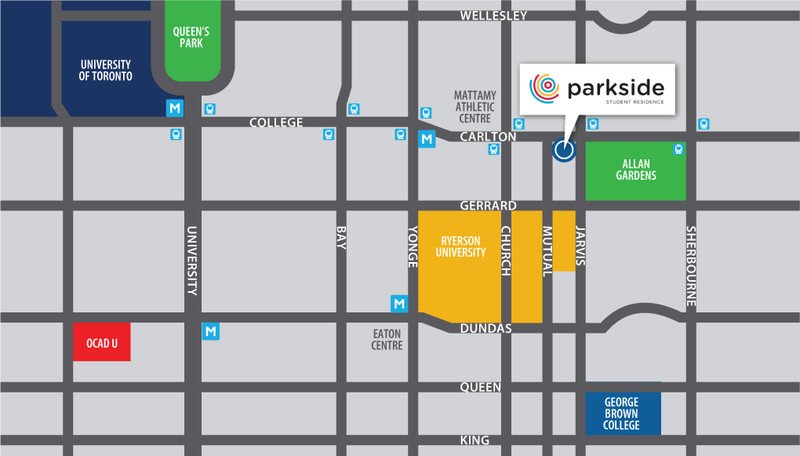 Parkside is located at 111 Carlton Street, Toronto, ON M5B 2G3. View our location page for more information.